India's Consul-General Riva Ganguly Das brought India's message of yoga at a noon-time ceremony marking the summer solstice in the northern hemisphere. More than 12,000 people participated in the 13-hour yoga marathon that started at 7.30 am. 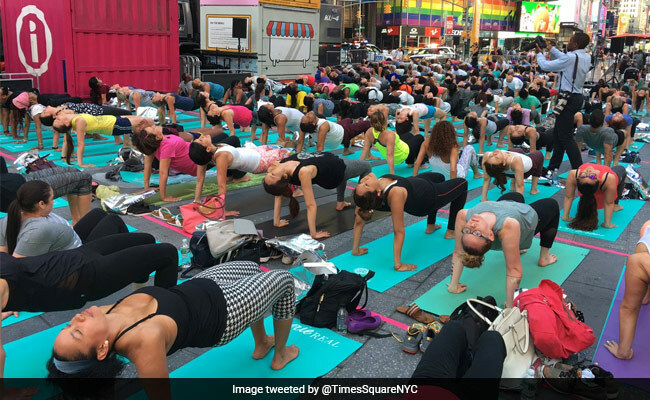 New York: A month after an insane attack on Times Square by a driver who ploughed through a crowd killing a woman and injuring 22 people, thousands brought an outpouring of peace through yoga on Wednesday to the landmark zone billed as the crossroads of the world. More than 12,000 people - a microcosm of the world in a city of immigrants - participated in the 13-hour yoga marathon that started at 7.30 am. This was the 15th year the summer solstice was celebrated with yoga in Times Square, a practice that began long before the UN declared June 21 as International Day of Yoga in 2014. The event is billed as "Solstice in Times Square: Mind over Madness". This year its theme was "Ahimsa, Non-violence," according to Tim Tompkins, the President of Times Square Alliance which organises it. The Ahimsa theme was appropriate this year after last month's vehicular attack in Times Square. Authorities are reluctant to call it a terrorist attack and attribute it to an American who was high on drugs. Stretching across several city blocks along Broadway, New Yorkers and tourists performed 'asanas' in hour-long sessions with instructors from several yoga organisations and studios with colourful yoga mats spread on the street. Suresh Prabhu Says Yoga Is "India's Gift To The World"